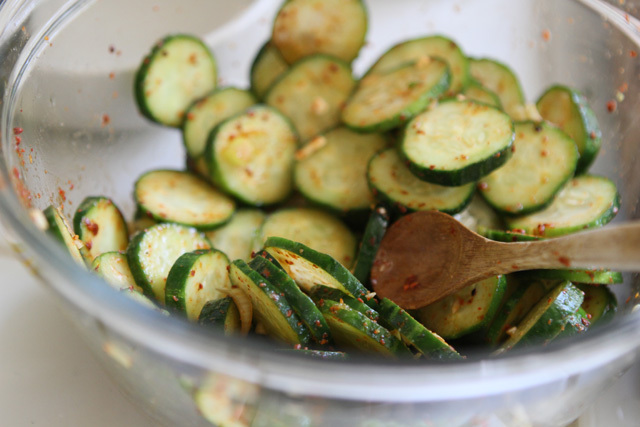 'Muchim' is the Korean word for any dish that is made by mixing vegetables and sauce ingredients by hand in a bowl. 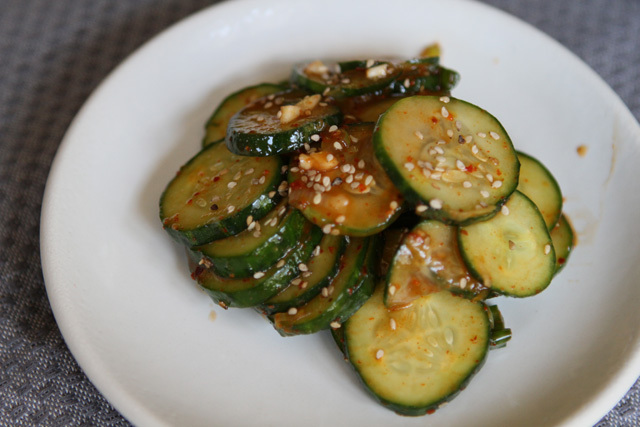 These dishes are usually whipped up in the kitchen as a quick side dish and are a nice alternative to kimchi when you don't have any in the house. Definitely a useful recipe to have on hand. 1. 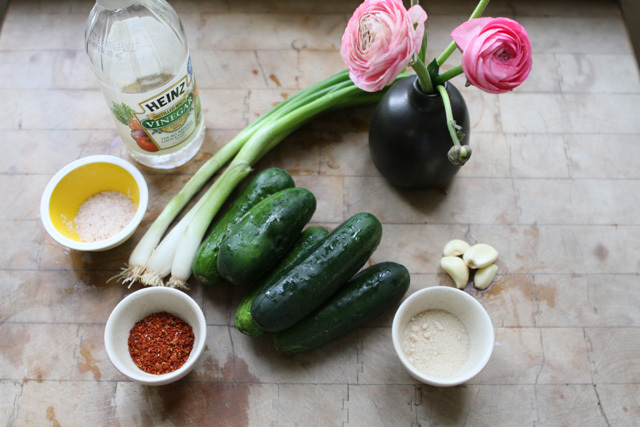 Put the cucumber slices and the salt into a bowl and mix around with your hands. Let sit for 5 minutes then squeeze out any excess water that formed. 3. Add sesame seeds and it's ready to serve. Will stay good in the fridge for 1 or 2 days. This looks and sounds delicious. I need some of that. I look forward to your posts and admire your great photography. I am going to prepare this, too!!! Thank you, girls, for sharing!!! What kind of red chili do you use?? Loving the recipes and can't wait to try them! korean red paper flakes work the best for this dish. you can find them at any korean markets. I am definitely making this...all the little dishes of veggies are my favorite part of dinner in Korean restaurants! Hi! I love both of your blogs- Bap story is such a cute idea and I look forward to many more delicious posts. If you're taking requests, could you do a post on a healthier dukbokki and maybe some recipes for healthier soju cocktail recipes? Thanks! This sounds deliciousss. Perfect for this heat wave,too. 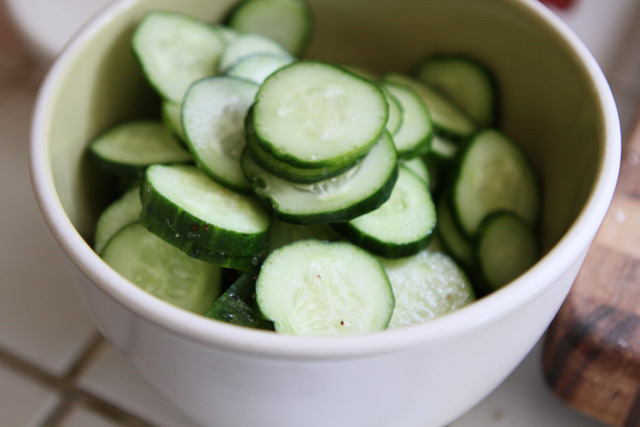 I think this is the first time I have drooled over cucumber. You guys are amazing! I will be making this to take to work for lunch. It looks delicious! Thanks for sharing. I'm super excited for your blog!!! i think you should do a post on spicy squid or the little candied potatoes. or dak jim. yayyyyy korean food. Thank you so much for sharing these yummy yummy recipes. I made the tofu and cucumber salad yesterday! I doubled the recipe though, and I think there was more sauce than seen in your photo, but IT WAS THE TASTIEST SAUCE I've had in a while. Once again, I'm loving Bap Story! Thanks for replying to my question Jeana! I'm so excited for Bap Story too! So far I've made your kimchi bokum bap and now this! I miss my mom's Korean cooking so much! She lives 1700 miles away, so it's nice to be able to use the kimchi and gochu-gadoh she sends me on different dishes. This is so refreshing for summer. I've already made 4 batches! YUM!